As a kid growing up in the 90's, the Teenage Mutant Ninja Turtles were, needless to say, a huge part of my childhood. I loved the original films (the first two at least), watched every episode of the animated series, and had several of the toys, including the Turtle Van and Technodrome, so when I heard that a new film based on this franchise was heading to theaters back in 2014, I was nervous yet excited. Luckily, I really enjoyed that film and was more than excited for a sequel which could dive deeper into this amazing universe, and that's exactly what Teenage Mutant Ninja Turtles: Out Of The Shadows did. 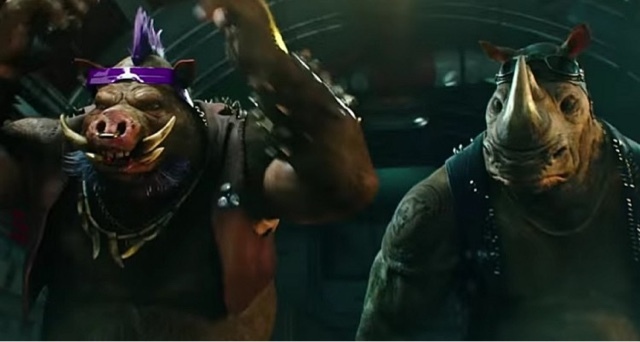 The thing that got me the initially excited for this sequel was the introduction of two of my favorite TMNT villains, Bebop and Rocksteady. I first heard this news when casting conformations came out about WWE superstar Sheamus taking on the role of the mutant rhino, Rocksteady. I'm a huge wrestling fan, so this news piqued my interest. 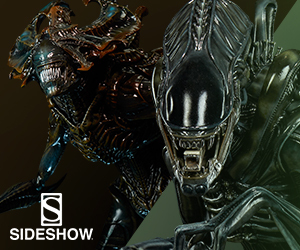 Then came the news that a certain interdimensional brain-looking creature would be making an appearance. 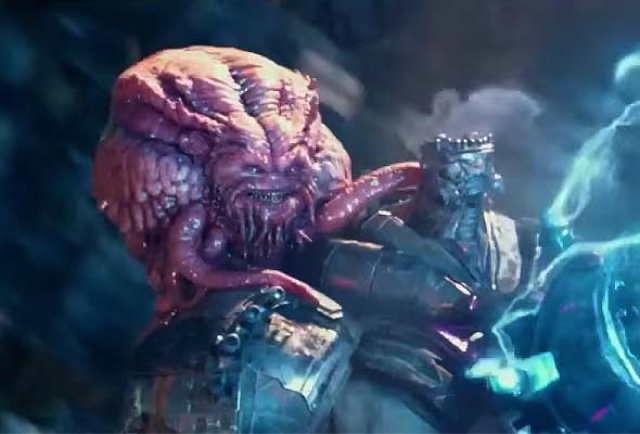 That's right, Krang would finally make his way into a TMNT film. And when the trailers finally revealed him and what looked like (and ended up being) the Technodrome, I was over the moon with excitement. Getting Krang, the Technodrome, and, as I had hoped, Dimension X in this film was more than I could have dreamed. This huge nostalgia fest was directed by Dave Green, who made his directorial debut back in 2014 with the sci-fi family film Earth To Echo. I thought Green did a fine job directing this film, seeing as it's his second time in the chair. Could it have been done better? Yes, but overall it worked for me. One of the things I did really enjoy about this movie, however, was the story that was being told, and you can thank the writing duo of Josh Appelbaum and André Nemec for that. Appelbaum and Nemec teamed up to write the original film, so they already knew the characters and the world they live in. They also wrote the hugely successful Mission: Impossible - Ghost Protocol and created the CBS series Zoo, which is about to enter its second season. 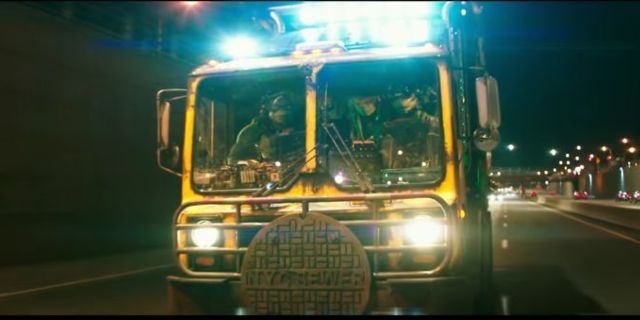 Teenage Mutant Ninja Turtles: Out Of The Shadows starts off a year after the events of the first film. The Turtles are still hiding from the public, even so far as to let Vern (Will Arnett) take all the credit for taking down Shredder. The film starts off with a pretty sweet sequence of the Turtles jumping around the city, which, I have to say, would have looked awesome in 3D, but alas, I saw it in 2D. The main part of the story centers around Shredder, who breaks out during a prison transfer, in one of the coolest scenes in the film. Two words...TURTLE VAN!! This scene was actually filmed near my hometown in Buffalo, NY, which is pretty cool if I do say so myself. At the end of this scene we get our first taste the evil Krang and Dimension X (though it's never called that by name). I was so excited for him in this film, but this scene was a bit of a disappointment. The only reason it was there was to set up who Krang was and what Shredder's role would be. It was just a bunch of exposition and it felt like it was being spoon fed to me, which I hate in movies. We see Krang again in the third act as he transports his giant battle station, the Technodrome, to Earth in an attempt to conquer the planet. This part makes up a bit for his weak introduction by giving us a pretty badass version of the Technodrome. We also see Krang's huge robotic body, which I was honestly nervous about how it would translate to love action. But it was pretty awesome. I just wish we had gotten a bit more of Krang and the Technodrome, but perhaps the Turtles will travel to Dimension X in the next film and battle Krang on his home turf. 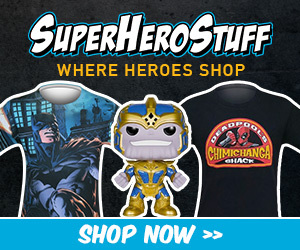 Stephen Amell, of Arrow fame, entered the film as the hockey stick-wielding vigilante Casey Jones, who starts off, in this, as a cop. He is pulled into the world of the Turtles after Shredder, Bepop, and Rocksteady escape on his watch, and he makes it his mission to capture them. Amell already has had experience playing the vigilante role, but Casey Jones is a much different character from the Green Arrow. On Arrow, Amell plays a very serious and stoic character with Oliver Queen, but in this he was able to turn up the with and charm and crack a few jokes. It was great to see this side of him and he played the part perfectly. And any time he was in, what I like to call, "Casey Mode", where he's using his hockey stick to take down baddies, he absolutely shined. I can't wait to see more of him in future installments. One of my favorite scenes with him had to be when he first goes down to the Turtles' lair and meets Splinter. If you've seen it, you know what I'm talking about. My other favorite characters were Bebop and Rocksteady. The mutant Warthog and Rhino were played by Gary Anthony Williams and Stephen "Sheamus" Farrelly, and what a great job they did. They were exactly what I imagined their live action versions would be like, cracking jokes while acting tough at the same time. And they were definitely a force to reckon with. We also saw the return of Megan Fox as April O'Neil (who I've never been too fond of) and Will Arnett as Vern Fenwick. The cast did have a couple other change-ups and additions with Brian Tee taking over as Shredder (and doing a great job, also no more Edward Shredderhands), Peter Ploszek taking over the voice of Leonardo (he did the motion capture for Leo in the first film, but Johnny Knoxville did the voice), and Tyler Perry entering the film as the slightly-mad scientist, Baxter Stockman. But I can't talk about the cast without talking about the titular characters...the Turtles. In this film, the Turtles actually took more of a central role than in the first. Yes, the movie was called Teenage Mutant Ninja Turtles, but there just wasn't enough of them in the first film. That wasn't the case here. April's and Vern's roles were cut down drastically and that definitely made a big difference. I got to hang with the Heroes In A Half Shell the way I had hoped for, and their interactions with Bebop and Rocksteady were great, especially during the river scene, which was a nice mirror to the snow scene from the first movie. We finally got to see a bit more of the Rafael/Leonardo feud that was present in past incarnations and it was done very well. Overall, I really enjoyed this film. As I said before, there were a few things that didn't work for me, like the Krang intro and the shortness of his time in the film in general, but one of the things that bugged me the most were the Foot Clan. They are supposed to be elite, deadly ninjas, yet a reporter and a guy with a hockey stick can give them a real run for their money? I mean, come on. But, other than that, I had a great time watching this film, and if you enjoyed the first one, you need to go out and see this one, because it is so much better. I love the movie and I just hope there is another movie coming..